When it comes to adopting a child, prospective parents have plenty to worry about. The preparation process can become even more complex when adopting a baby due to infantile needs and considerations. From childproofing your home to picking a physician, we have covered several preparatory subjects in our blogs to provide adoptive parents with as much information as possible. A is 4 Adoption is here to simplify the efforts for prospective parents and birth mothers utilizing the open adoption process. Our facility works to reduce the stress and wait times that are common with any typical adoption agency in California. Adopting a baby can be an intensive process with thousands of details that need to be taken care of to ensure a smooth transition into parenting. Today, we’ll discuss the process of developing a healthy nutrition plan, as well as the benefits of doing so. Equipping your adopted child and family with the tools needed to eat healthy can benefit everyone! Proper nutrition has grown into a subject of major debate in this country due to the expanding rates of obesity amongst our citizens. The Center for Disease Control released statistics that show that more than a third of adults in the U.S. are technically obese. As such, the associated health risks include diabetes, cancer, stroke, heart disease, and more. Many of these severe illnesses can be avoided by simply fighting weight issues. Obesity rates for children have now jumped up above 17-percent, creating a grim picture for our country’s future. Proper diet and exercise are the building blocks for a healthy life, which is why we’re so focused on bringing proper nutrition into your home! Before adopting a baby, it’s key for you and your partner to begin the process of updating your diet as soon as possible. Changing a lifestyle can be very difficult during the best of times, and the stress involved with your adoption process makes getting healthy that much more intense. During times of duress, people often resort to junk food for fast, satisfying sustenance. The cost of eating healthy is often misconstrued here as well, where prospective parents claim that eating healthy simply costs far too much. Putting in the time and effort to prepare healthy meal options can prove to actually be much cheaper when compared to purchasing processed, fat-laden foods. As the parents, you’ll need to start the process now to get in the habit of making healthy nutritional choices. This way, your new miracle will come into a household that is provided by energetic, healthy parents. While not a common occurrence, one dealing we’ve encountered happens when overweight adoptive parents are denied the chance to raise a baby because the birth mother wanted a healthier couple raising their child. We understand that this is not always a fair assessment of adoptive parents, but the logic makes sense to a degree. Providing your nutrition plan and describing your healthy diet may prove beneficial for biological parents looking to place their infant with top-notch role models. When you and your partner create a healthy household to keep every member happy, everybody wins! Proper nutrition is the building block for long-term health and fitness success. 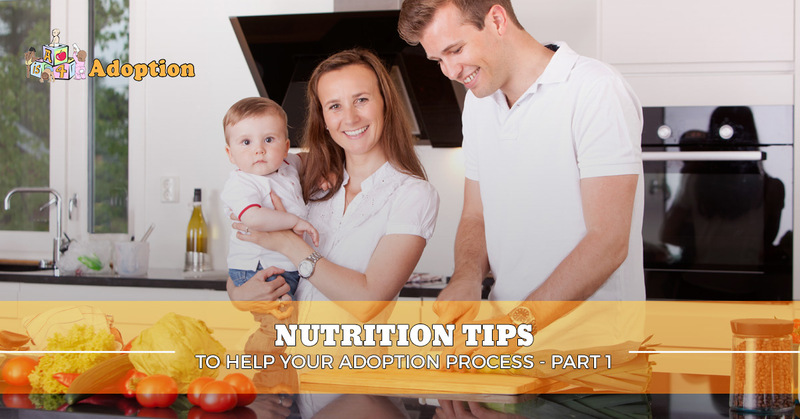 While going through adoption can be a stressful time, it represents the perfect opportunity for you to begin healthy habits that will benefit you and your new child. A is 4 Adoption is here to help prospective parents and birth mothers every step of the way, from guidance and emotional help to financial support and more. Our adoption center aims to beat the speed and quality of services offered by any standard adoption agency in California. Next time, we’ll look at a few long-term tips that may help you in your quest for raising a happy, healthy newborn as your own. Anyone considering adoption can contact us today to learn more about our quality program!